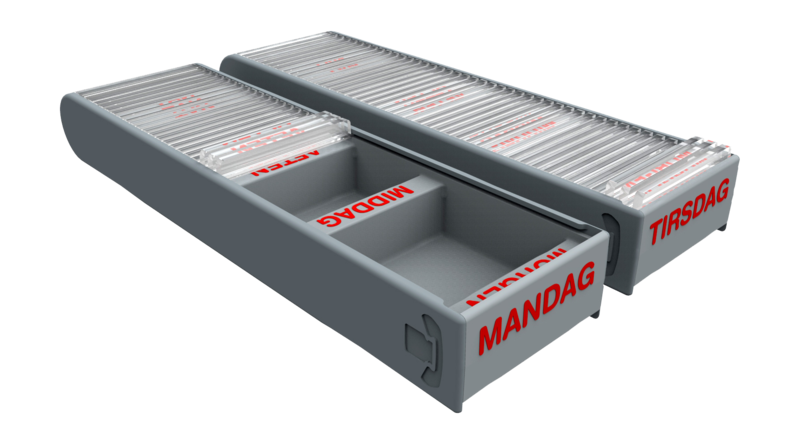 Many can recognize the problem of dosing boxes where the lid is difficult to remove and replaced. Or situations where the lid falls off and the pills fall out. This is not the case with DoseTray because the lid is an integral part of the dosing box. It functions as a rolling lid that can be rolled back and forth. Even by one hand. Firstly of all, DoseTray is easy to open. Also for citizens with trembling hands or reduced finger strength. Secondly, the pill compartments for morning, noon, evening and night appear in chronological order in DoseTray. The rolling lid allows the box to be opened little by little as the day progresses. Finally, the lid can be taken off and can be washed together with the dosing box in the dishwasher ensuring maximum hygiene. On DoseTray, the weekdays are placed at the end of the box instead of on the lid. This means that the weekdays are visible when there is a row of DoseTrays in a DoseCan. DoseTray is available in a box of 8 items, i.e. dosing boxes for 7 weekdays + one blank DoseTray wothout text. DoseTray has the same size as other common dosing boxes on the market. Design and idea by Jesper K Thomsen, founder, CEO and co-owner DoseSystem ApS.